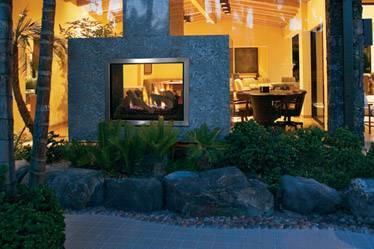 Outdoor fireplaces from Lennox Hearth Products can transform an outdoor setting into a gathering place of comfort. 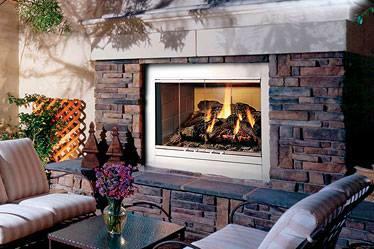 With gas- and wood-burning models, we offer unique models that are easy to install and built to last. 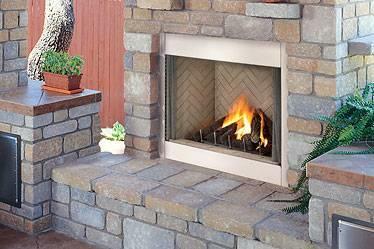 Our selection of outdoor fireplaces offers the touch you've been looking for. The Montebello See-Through gas fireplace combines unique features with versatile design to deliver an unsurpassed viewing experience, whether enjoying it from inside or outside the home. Distinctively elegant, heavy-gauge stainless steel design throughout, with premium options and one of the largest viewing areas available in an outdoor fireplace. Large indoor/outdoor fireplace with stainless steel weather surfaces features a sleek, louver less design that complements contemporary kitchen appliances and furnishings.